The open-plan living, dining and kitchen provides breath-taking views of the ACE Basin in every direction and is a wonderful gathering place for family and entertaining. A wood stove keeps the room cozy on cool evenings. The kitchen is fully equipped with range, dishwasher, refrigerator and microwave. Tile countertops provide a workspace that is attractive and easy-care. A large pantry with built-in shelving provides an abundance of storage space. Each of the three bedrooms is spacious and enjoys it’s own distinctive view. Built-in queen-size platform beds have storage drawers underneath and attached closets on either side, eliminating the need for furniture. The master suite has a private bath with a large walk-in ceramic tile indoor/outdoor shower. 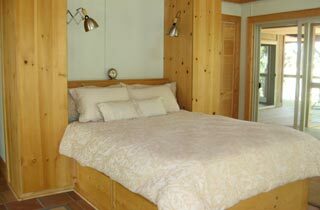 The two guest bedrooms share a second bath with pine cabinetry and ceramic tile shower.